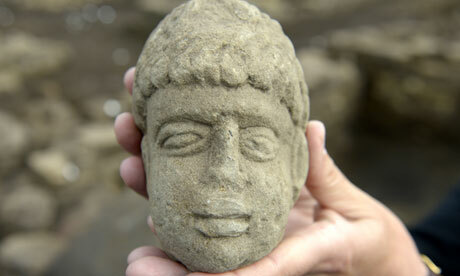 ROYAUME UNI – Binchester - An 1,800-year-old carved stone head of a possible Geordie Roman god has been discovered buried in an ancient rubbish dump. The discovery was made by a first-year archaeology student at Binchester Roman fort, near Bishop Auckland in County Durham, as the team dug through an old bath house. The 20cm sandstone head, which dates from the second or third century AD, is similar to the Celtic deity Antenociticus, thought to have been worshipped locally as a source of inspiration in war. A similar head, complete with an inscription identifying it as Antenociticus, was found at Benwell, Newcastle upon Tyne, in 1862. Dr David Petts, a lecturer in archaeology at Durham University, said: "We found the Binchester head close to where a small Roman altar was found two years ago. "We think it may have been associated with a small shrine in the bath house and dumped after the building fell out of use, probably in the fourth century AD. "It is probably the head of a Roman god – we can't be sure of his name, but it does have similarities to the head of Antenociticus found at Benwell in the 19th century. "Antenociticus is one of a number of gods known only from the northern frontier, a region which seems to have had a number of its own deities. "It's possibly a Geordie god, though it could have been worshipped at the other end of the wall." Antenociticus is not mentioned at any other Romano-British site or on any inscriptions from Europe, which is why it has been identified as a local deity. VIET NAM - Binh Son - Thousands of antiquities from an ancient sunken ship have been discovered in Binh Son district in Vietnam's central province of Quang Ngai, state-run news agency reported on Monday. Among the discovered objects, over 4,000 artifacts, including coins and ceramics, were recovered undamaged, which are believed to date back to the 13th century. The objects were collected from the seabed during an excavation on June 4-23, according to the Quang Ngai provincial steering board for archaeological exploration and excavation of underwater cultural heritage. The ship measures 20.5 meters long and 5.6 meters wide with 13 holds. Remnants left from holds 4 to 6 prove that the ship caught fire before sinking. The findings are expected to contribute to the research of Vietnam's ceramics in the 13th century and enrich the country's cultural heritage. 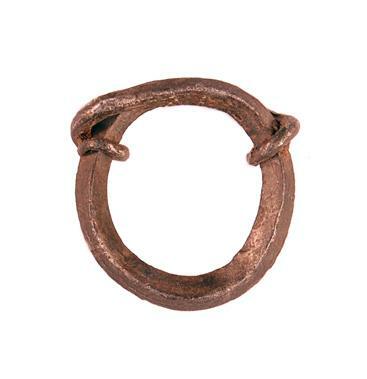 ROYAUME UNI – Rugby – A rare Viking ring discovered on the outskirts of Rugby goes on display to the public for the first time later this month to celebrate the National Festival of Archaeology. Rugby Art Gallery and Museum stages the free Relics and Romans day on Saturday, 13 July. The ring dates back to the 9th or 10th century, and was declared treasure after experts discovered it contained silver. Thering proved a rare discovery of Viking artefacts in Warwickshire, and has led experts to suggest the local area had links with Viking traders.